CheeWees were born at a candy company � naked and un-cheesy! According to Alan Elmer, Sr., president and one of the fifth-generation owners of Elmer's Fine Food. Christopher Miller founded the Miller Candy Company in New Orleans in 1855. Eventually, it went to Miller's dynamic young son-in-law, Augustus Elmer�Alan's great-grandfather. In time, that business was renamed Elmer Candy Corporation and passed on to the five sons of Augustus Elmer. During the Great Depression of the 1930s, desperate to diversify in order to stay afloat financially, the Elmer brothers invented the corn curl, the grandfather of today's CheeWees. "It was a product that the Elmer family developed on machinery that they found at the World's Exposition in Chicago," says Alan. The machinery was originally developed to produce animal feed, but the Elmer brothers saw greater potential inside the machine. "They purchased one of the machines and brought it down to New Orleans. They actually disassembled it, carefully noting all of its engineering specs. Then, they redesigned it to make a better corn curl," Alan explains. "When they re-engineered the machine, they began to produce and sell the new product using cornmeal." The process, still used today, removes moisture from the cornmeal by extruding bits of it onto spinning metal plates. The friction heat raises the temperature of the moisture, which escapes as water vapor, causing the corn curl to "puff," similar to the way water vapor pops popcorn. The puffed curls are then baked and flavored. Since they are not fried, CheeWees have less fat than competitors, according to nutrition labels on the package. Soon after developing the process, the Elmer brothers experimented with flavorings on the corn in an attempt to broaden the appeal of their corn curl. "Cheese was the favorite of the tested flavors, and the brothers thought they could have success with it. The cheese-flavored corn curl was born and packaged in cans for sale," says Alan. Ironically, the new product still had no given names aside from "corn curls." Soon after the introduction of the cheese flavor, a naming contest was held for their new product. "My grandfather, Morel Elmer, Sr. had a contest here in New Orleans after they started experimenting with flavorings on the corn," says Alan. "Someone submitted the name 'CheeWees,' which was the winner. They branded the product with that name and the rest is history." After the Great Depression, the Elmer brothers refocused on candy production. 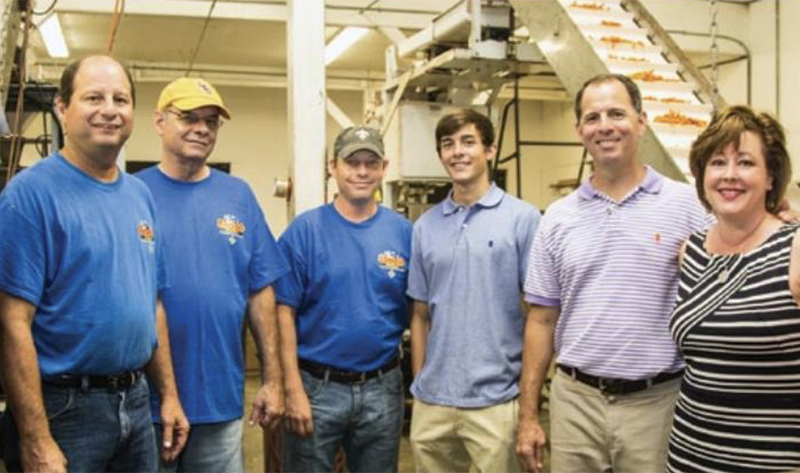 With the family's blessing and in an effort to revitalize the CheeWees brand, Morel Elmer, Jr., Alan's father, opened the cheese curl business in 1946 as a division of Elmer Candy Corporation. That division would later become Elmer's Fine Foods, with its focus on CheeWees. Morel Elmer, Jr., is generally credited with working with a bag manufacturer to develop the first bag packaging for snack foods. Known as glassine, the waxy translucent product is similar to, but not exactly like, the bags Hubig's pies were sold in. "That was long before Frito-Lay or any other similar company existed, and he sold a world of bagged CheeWees snacks," Alan proudly claims. The original bagged price in 1946 � .05 cents! As the snack food category began its explosive growth in the late 1930s, mergers and acquisitions formed as normally would happen in any industry. The merger of Frito and Lay would have a profound impact on the category and CheeWees in particular, driven by some star power. "The Frito Corporation joined with the Lay Corporations to become Frito-Lay, and once that happened, with the investment money from Joan Crawford and her family, they started buying up and producing snack food products other than the Frito's corn chips and Lay's potato chip," Alan says. Eventually, that juggernaut came t̻te-a-t̻te with CheeWees. "In the 1950s, Frito-Lay began producing a cheese curl just like ours through permission granted by Elmer Candy Corporation because we held the rights to the process of making the cheese curl." That licensing agreement ended in the 1960s when the Elmer family sold the Elmer Candy Corporation, thus opening up the cheese curl category to other manufacturers. Elmer's Fine Foods was not included in the 1963 candy company sale, but the new owners did acquire the trademarked names of all products then owned but the candy company, including the "CheeWees" name. The new candy company continued to manufacture cheese curls under the "CheeWees" name, but focused on a canned product for the Central American marked. Stripped of the name for their product, Elmer's Fine Foods was forced to market the cheese curls to retailers under the "Chee-T" and later "Cheez-Snax" for the next 30 years. Co-owners Alan and his brothers, Paul and Stephen, who today work together in the company, came into the business in the 1980s. During that time, the plant was modernized, new products were developed and sales increased. As president, Alan set his sights on bringing the "CheeWees" name back where it belonged. "That was the one thing that really bothered me�that we weren't using the name 'CheeWees'," he says. About the same time, Elmer Candy Corporation ceased their snack food operations in order to focus on candy sales and development. The "CheeWees" name lay dormant and unused. "That's a name that my grandfather started, and it was frustrating not to be able to use it." However, a phone call and polite conversation began the process of bringing the name back home. "Through the graciousness of the guy who ran the candy company at the time, Rob Nelson, it was easier than I thought it would be to get it back," says Alan. Aware of the two companies' mutual history and impressed with Alan's passion to regain a hallmark of his family heritage, Nelson agreed that the original "CheeWees" name belonged with the originators of the product and category. A deal was struck in 1993, and the name was Elmer's once again. "Mr. Nelson was very kind to do what he did," Alan gratefully recalls. After the "crown jewel" of the company was retrieved, time passed in that laissez-faire way New Orleans is famous for. Sales were strong, new flavors and additional products such as caramel popcorn and bagged peanuts were brought to market. The future looked cheesy until everything went black in 2005. "We almost didn't come back after Katrina," says Alan. Hurricane Katrina rudely deposited nearly 11 feet of water in the 9th Ward neighborhood where the factory was located. About the only thing not destroyed was the dirt the building stood upon. "Everything here sat under water for the better part of a week. Literally, underwater. It wasn't like the water came in and left." Once it did leave, a thorough assessment and rebuilding began. Every square inch of the building was rebuilt, in the same 9th Ward neighborhood where the business had been for years and years. Eventually, the machines were recreated with the help of Economy Iron Works of New Orleans, the original builder of the CheeWees extruder machines. "They were near the building on Magazine Street where my father split the company off from Elmer Candy Corporation in 1946 and are still in business today." Alan's wife, Lori, says of the time, "People called us for months, asking when we were coming back, if we were coming back, encouraging us to come back." With great pride, Alan says, "We were out for about 14 months, but Elmer's is a true New Orleans survivor." Currently, Elmer's Fine Foods produces 15,000 cases of CheeWees a month, ahead of production figures from before the storm. Five tasty variations of CheeWees are packed in assorted sizes: Original Cheese, Bar-B-Que, Hot-N-Spicy, Green Onion, and Jalape̱o, which according to some tasters is nuclear powered. "It's a little strong," quips Alan, with the grin of the cat that got the canary. Most find their way into convenience stores, grocery stores and the like. But since Katrina, a substantial part of the business is web connected. Lori says she created the website for people from New Orleans (or who wish they were from New Orleans) to go online and order an assortment of the five flavors of CheeWees currently offered. It has proven to be an unexpected asset for distribution of CheeWees, with regions, national and even international sales. "During the height of the Afghanistan War, we had a tremendous amount of people sending CheeWees to a relative, or even just people wanting to send something to the troops," alan says. "It was one way that people with their boys or girls in the military could share the products that they know from New Orleans, like CheeWees." The gesture has not gone unnoticed by our service members; visits by returning veterans to the factory to thank the Elmers are not uncommon. "They tell us 'we missed the flavors of New Orleans (CheeWees) so much over there, and y'all are so gracious to send it to us.' There really is a deep-rooted affinity in New Orleanians for the things that are uniquely New Orleans!" As the company proclaims, CheeWees is�undoubtedly�The Big Cheese of New Orleans! (l to r) Paul Elmer, Sr., Stephen Elmer, Sr., Stephen Elmer, Jr., Ben Elmer, Alan Elmer, Sr. and Lori Elmer in the Elmer's production facility.